After a one years absence the Valley Gay Men’s Coffee House Group makes there way once more walking the streets of Halifax, NS along with 6000 other people being Proud and Gay for the Annual Halifax Pride Festival held on July 22nd, 2006. We would like to thank all the 20,000 people in attendance and our family and friends that cheered and routed us on in the Parade much Love and a Big Thank you. 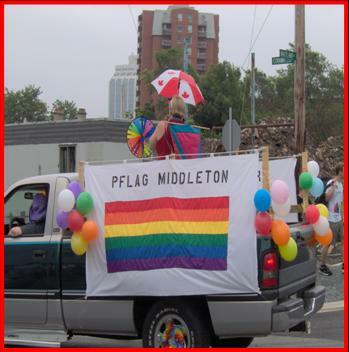 We also were happy to see that PFLAG Middleton Chapter and the Lavender Follies join us in the Celebration to represent the Annapolis Valley and Middleton area. Next year seems far away but it won’t take long until again when we’re back on the street waving those colourful flags showing our Pride to each and everyone of you. Thank you once more for all the Support and Acceptance of who we are as Individuals and also part of the Community at large. Just over a month away to the yearly Halifax Pride. It’s suppose to be fun, and tons entertainment including the yearly tradition Pride Parade. With this year theme being “Diversity”. 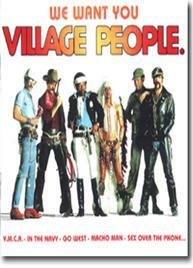 With that in mind we the VGMCHG and the Middleton Pflag Chapter has join together to dress up as our favourite Village Person. As we dance and walk to some of their favourite hits (In the Navy, Macho Man and of course YMCA) through the parade routes of Halifax. Lets all have a great, fun, safe and Gay o time this year at Halifax Pride 2007!! !